Italy is, of course, widely known for its cousine. However, but some cheeses that go under the radar include tasty and sometimes spicy varieties like taleggio, stracchino, gorgonzola. In general, the most important things to try in Milan (and the whole of Lombardy) include milk, cream, butter, cheese. It may sound strange, but it's true. A great majority of the classic dishes consist of milk and cream, butter, mascarpone, cheese and ricotta, even the names of the towns, such as Crema and Cremona remind you cheese. However don't think that everything's the same and tastes the same: there is a huge variety in the rich cuisine of Milan. Rice tends to be more popular than pasta and, in fact, rice absorb more cheese butter and broth. Sometimes they even throw vegetables or meat into the mix. However, pasta is quite important here as well with dishes such as "tortelli di zucca", which is ravioli stuffed with pumpkin, and "pinzoccheri," which consists of buckwheat noodles cooked with potatoes cabbage and cheese. Don't forget the soups: "zuppa pavese" (broth with bread and eggs) and "zuppa di porri e bietole" (made with leeks and swiss chard). Another typical meal is "polenta", topped with mushrooms or meat- a rich dish typically served during the winter. Finally, what about meat? Here you are "bresaola" dried beef; "carpaccio" thinly sliced raw beef; "arrosto" roast meat such as beef pork or veal and sausages. These meals are served with side dishes such as beans, mushrooms, or salad. Get in touch with Italian culinary and wine culture through a guided tour aimed to make you learn all about the world-famous Lombardy wines. Click here to book your culinary and wine tour in and around Milan with us! RESTAURANTS or by yourself with our RECIPES. Büseca – a stew of tripe, butter, tomatoes, and beans. The term "buseca" refers to the stomache of a cow- also known by its more gentle term, tripe. They thoroughly cleanse the tripe under cool running water, and place it to cook in a pot of boiling water so it begins to become tender. Next, Brown some butter, onions, sage and bay leaves in a frying pan. Add the tripe with a half cup of white wine to the frying pan. Then pour some hot broth and a little tomato sauce in the frying pan. Salt and pepper to taste and cook slowly for two hours. In a seperate pot, bring 200gr of garbanzo beans to a boil. Next, add the garbanzo beans to the tripe 10 minutes before it is ready to be served. Sprinkle with parmesan cheese and enjoy! Finely slice carrots, celery stalk and a small onion, and place them in a pot with some oil to gently sweat. Add pork ribs to brown over medium heat for about 15 minutes, then deglaze the pan with a bit of red wine. After the wine reduces, add tomato sauce and cover the pan to let it cook for 15 minutes more. While the ribs gently cook, wash the cabbage and break it with your hands (without using knife) and place it bit by bit to cook with the ribs- Replacing the cover to let it wilt. Repeat the same with the the rest of the cabbage until there is none left. If you prefer your cassoeula to be a bit more fluid, add one or two glasses of water. Let it sit to simmer for three hours, stirring occasionally. Flatten the veal cutlets out with the palm of your hands, put them in the flour and then in the beaten eggs. Then dredge the cutlets in bread crumbs, meanwhile heat olive-oil in a frying pan until hot. Add the cutlets to the frying pan and cook quickly turning once, so both sides brown. Serve hot garnished with parsley and a segment of lemon. L'OSSOBUCO – The milanese speciality with "gremolata"
Dust each piece of veal shank with seasoned flour. Heat olive–oil, butter, garlic, onion and celery in a heavy–bottomed frying pan. Sweat for about 5 minutes- or until soft but not browned. Add the shanks to the pan and cook for 12–5 minutes, until well browned on all sides. Pour a half cup of white wine in the pan (add a cup of water if needed) cover it and cook for one hour, or until the meat is tender. To make the "gremolata" mix together lemon zest, parsley and garlic until it forms something of a paste or pesto. Before serving the shanks, garnish them to taste with the gremolata. Pound slices of chicken with a mallet if necessary to tenderize. Sprinkle with a little salt, dust with flour, then dip into beaten eggs and Parmesan cheese. Heat olive oil and sauté chicken until golden brown on both sides. Then remove from pan. To the same pan add mushrooms and ham and sauté until are soft. Remove the ham and mushrooms and discard all the liquid from the pan. Put the cutlets back into the pan and add the ham mushrooms a little broth and 1 tablespoon of butter. Simmer and shake occasionalliy the pan until the sauce is smooth. Remove cutlets from the pan and pour the sauce over. Sprinkle with chopped parsley. IL RISOTTO ALLA MILANESE – The famous milanese first course "primo"
Il "risotto alla milanese" is a saffron risotto, and the traditional accompaniment to "ossobuco". RECIPE: In a large saucepan melt butter and cook the onions until traslucent. Pour a cup of white wine to deglaze the pan and continue cooking until it has reduced greatly. Add the rice and cook for two minutes. Add one cup of the boillig broth season with salt and stir. Continue adding broth as it evaporates, until rice is between "al dente" and tender - stirring constantly. 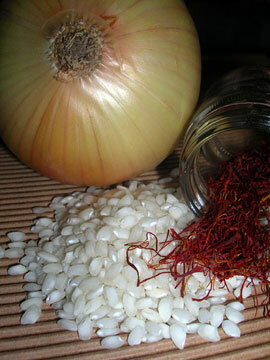 A few minutes before rice is done add the reconstituted saffron and stir. Cover and leave the risotto for 5 minutes, dusting with Parmesan cheese before serving. Traditional cake in Milan and known all over the world as the cake which people wrap in boxes during the Christmas season. It is quite dry and studded with fruit as well as candied cintrus zest. According to history it was invented by the noble Ughetto Atellani ("ughett" in milanese dialect means raisin) in the 15 century. But according to others, it was invented by a simply boy of a bakery whose name was Toni ("Pan de Toni" that's why "panettone"). By the ‘50s the panettone is become famous thanks to the sweet industries which produce this cake. 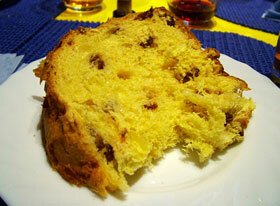 In this way the panettone could be apprecieted not only in milanese pastry–shops, but everywhere. Click here to find some of the most typical Milanese and Italian restaurants in Milan.